M40 east to join A40 into London. At Northholt take the 1st exit onto A312 (Church Road). Continue to to Harrow then take the second exit at roundabout, right turn onto A404 (Lowlands Road). At the large roundabout, take the second exit, straight on, to join A4006 (Kenton Road). Continue for 1.4 miles before taking left turn into Charlton Road. After 0.6 miles, take 3rd exit at roundabout onto Taunton Way. Follow the road around to join Camrose Avenue and then take signs for parking at ground. Take note of parking charges at ground and strict parking regulations close to ground. Check www.rac.co.uk for specific or more detailed directions. Train/Underground: Nearest station Canons Park Underground and Queensbury Underground on the Jubilee Line (both around 10 mins walk to the ground). Check www.nationrail.co.uk for specific times and connections of trains. 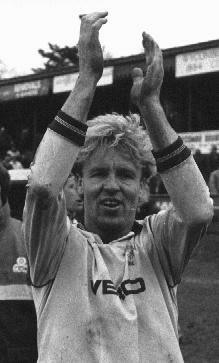 Nicky Evans salutes the Wycombe fans after making his debut at Loakes Park in March 1989. John Akinde - Two loan spells at Wycombe during the 2009/10 season from Bristol City - scoring 8 goals in 17 League appearances. Joined Barnet in the summer of 2014 after dropping down into non-League football with Alfreton Town the previous summer. Adam Birchall - Made a dozen League appearances for Wycombe during the 2004/5 season while on loan from Arsenal. Moved to Mansfield in May 2005 before joining Barnet in January 2007 following an earlier loan spell. Hakan Hayrettin - Remember that goal at Preston? Scott McGleish - Made more than 150 apps for Barnet between September 1997 and January 2001. Made his way to Wycombe after spells with Colchester United and Northampton Town. Scored 26 League goals for Wycombe during the 2007/8 season - a Club record. Gary Silk - Made one League appearance for Barnet on loan from Portsmouth during the 2003/2004 season. Loaned from Pompey to Wycombe for the 2004/5 season - making 28 apps before an early return in March 2005. Barry Silkman - Started out at Barnet before club hopping. Sam Togwell - Made four loan appearances for Wanderers from Chesterfield towards the end of the 2013/14 season. Switched to Barnet in the summer of 2014 following his release from the Spireites. Previously played more than 160 times for Scunthorpe. Magno Vieira - Signed for Wycombe in the summer of 2008 from Crawley Town made 21 League appearances for Barnet during the 2006/7 season.